Make custom shaped opening boxes using papier mache with this simple method. This opening egg shaped paper mache box shows the technique of using tissue paper, facial tissue or toilet tissue and pva glue to make strong, shaped containers suitable for miniature displays, keepsakes or candies. The boxes don't require thick layers of paper and days to dry. You can fit the lids on shaped paper mache boxes with a simple paper hinge, or an inset lid support as shown here. The PVA glue makes the structures strong without requiring thick layers of paper. The final box will be given a coat of artist's gesso to smooth the outside, which will further strengthen the box. This is a fairly simple technique to use with children. I suggest you have them prepare their torn strips or sections of paper before they get out the glue! Basic Shape - You can make many shapes over balloons as I did for the egg shape shown here where I used a modified water balloon. You can also make shapes over existing forms if you wrap them first in clear plastic wrap and make sure they are protected from the moisture and glue. For other shapes (acorns for example) make the basic shape by wrapping a clump of plastic bags or newspaper with masking tape, string or scrap wool yarn to shape the bags or paper into a useful base. Paper - I use recycled packing tissue for most of my boxes as it is easy to manipulate and strong once the glue layers harden. I have also very successfully used this technique to make a full sized baby seal with layers of the cheapest toilet tissue over a shaped plastic bag. Facial tissue works as well if you have an inexpensive source. Strips of kraft paper or newspaper will work, but are more difficult to shape and take much longer to dry. Inexpensive Small Paint Brush - not an artist's brush! to brush on the pva glue mixture. PVA (White) glue - mixed with water to a thin, but not runny consistency. I usually use large containers of glue from the hardware store for these projects, especially for a class, but any pva glue will work. Do not thin it too much or you will weaken the glue. Ribbon, String or Large Elastic Band - to act as a guide for marking the cutting line. Sharp Scissors or a Craft Knife - To cut open the papier mache shape. Lightweight Card - to make a lip for the base of the box in order to line up and hold the top of the box in place. To make an opening egg shaped papier mache box as a container for miniatures for a panorama egg, I used a water balloon as my basic shape. Other small balloons will work as well. The water balloon didn't have the correct shape for an egg as it was too fat near the neck of the balloon. I modified the balloon shape once it was inflated, by wrapping the neck end of the balloon with package tape to hold in the balloon at the neck end. I could have added extra papier mache, but that would have changed the shape on the inside of my box, and I wanted it even for my miniature scene. For this method of papier mache you don't soak the paper strips, you apply a layer of pva glue to your underlying shape, press pieces of tissue paper into the glue, smooth them, paint on a second layer of glue, or paint glue around the edges of the paper, and add more layers of paper. As you are using thin painted on layers of glue over paper, you don't get the thick squidy mess you can get when working with 'regular' paper mache. If you want a very smooth shape, use smaller sections of paper. Brush a layer of glue mixed with a bit of water to thin it onto your basic shape. Take a piece of tissue or toilet paper, and press it into the glue. Brush glue over and under the edges of your first piece of tissue paper, add more glue to the surface of your shape next to the first piece of tissue paper, and place another section of tissue. Continue working around your shape until you have an even coat of tissue paper and glue, about three to four layers of tissue thick. If you are working over a balloon you shouldn't see the color of the balloon clearly through your first coat of tissue paper. Brush glue over any loose edges of paper, and set your shape aside to dry thoroughly. If you are in a rush, you can use a hair dryer on these thin layers of paper mache, but don't use it too hot, or you can pop a balloon you are using for the underlying shape. How Thick Should the First Layer of Paper Mache Be? When your first layer of tissue paper mache is dry, you will still be able to see the basic shape underneath the layers of tissue and pva glue. The coating with only be slightly thicker than a layer of printer paper, and you will still be able to squash the shape easily. You want to continue adding three to four layers of tissue paper and glue, then drying the coating between layers until your basic shape is fairly firm. The key is to get multiple thin coats to dry, allowing the pva glue to cure between coats. For most small boxes you will only need to make two or three coats. Larger shapes may need more coats to support the basic shape across a longer length or width. In the photo on the previous page, you could see the color of the balloon under the dried paper mache layer. If you are using white tissue paper, you have usually got a thick enough coating when the color of your basic shape doesn't show through your dried paper mache coating. To give the final coat a bit more strength, paint a layer of regular (not thinned) pva glue over the outside of the entire shape and set it aside to dry. Make sure you set it on a plastic container or plastic wrap so the glue on the outside layer doesn't stick to your work surface. If you want to make sure your basic box shape is rounded, make sure your coats of paper mache don't weight down your basic shape and cause it to flatten on the bottom side. Set it on a ring or donut of plastic to dry, rather than leave it sitting on a surface where the bottom edge will be flattened, unless you want one side slightly flatter. If you need a ring or 'foot' for your shape to stop it from rolling, roll a thin roll of tissue from a long strip, form it into a ring, and glue it to the base of your box shape, making a 'foot' similar to the one you see on the bottom of a china platter or heavy plate. If you need to , you can cover the edges of this ring to blend it into the paper mache shape and anchor the foot securely to the rest of your paper mache. When your basic box shape is thick enough and you have allowed it to dry completely, wrap a length of ribbon or string around the shape and tape it in place to use as a marker for the line where you will divide your box in half. Think carefully about how you intend to use the box before you mark it. I wanted to put a scene into the bottom half of my egg and have a viewing window above the scene, so I set my box so that it would come apart on the long edges of the egg. If you want your scene to be viewed from an open end of the egg, you might want to make your box come apart around the 'waist' of the egg. The opening line doesn't have to divide your box into two equal halves. Divide the box in the way that makes the most sense for how you intend to use the box. When you have drawn a line with a pen or pencil along the ribbon or string marker from the previous step, use your craft knife or scissors to carefully cut your shape open along the line. If you have a balloon or a plastic bag shape as the basis for your box, it will be easy to slice through the layers of paper mache to cut the balloon and burst it, or to cut through the plastic beneath the paper mache without ruining the underlying shape. 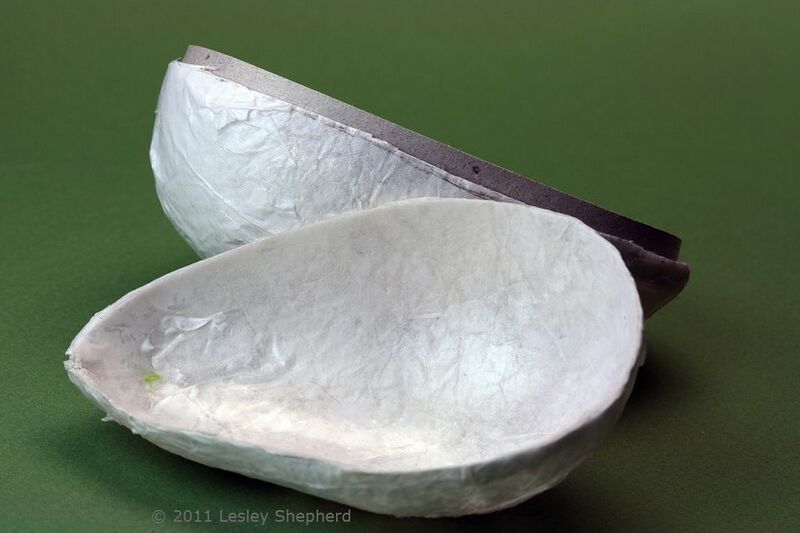 If you used a piece of china or a plastic egg or other container for your base shape, you will have to cut carefully through the paper mache, making sure you don't cut into the original you used as a basic shape. As long as your paper mache layer is dry, it should cut easily. This paper mache isn't usually more than 1/8 inch thick so you can cut it with sharp scissors or a craft knife. To make it easier to line up the halves of your box when you close it, you should install a think card lip on the opening edge of the paper mache box base. If your shape has straight sides where the box edges join, this isn't much of a problem. If, like this egg, the box joins at curved surface, you will need to make sure the lip of your box is very narrow, only and 1/8 of an inch or so, just enough to hold the other section of the box in place. To make the lip, cut a length of lightweight card (roughly photo paper weight) from a piece of scrap. Test fit the card inside the opening on the base of the box, curving it and folding it as necessary. When you are sure your lip will fit, run a bead of glue along the bottom half ot the strip and set it on the inside of the box, so that the strip sticks up just enough to hold the top layer of the box. Set the box base aside until the glue on the lip has dried, then test fit the top of the box over the base. Adjust the size of the lip if necessary. Leave the paper mache box to dry for 24 to 48 hours to allow the pva glue to cure completely. Once dry you can add decorative outer layers of tissue or gift wrap, or you can add a coating of artist's gesso to give you a smooth, strong box. If your box turns out to be too thin, don't throw it out. Once the pva glue has cured, you can usually add more layers to the outside of the box, even if it doesn't have a base shape to support it. Just make sure you add thin layers and allow them to dry thoroughly as you build up the coating.